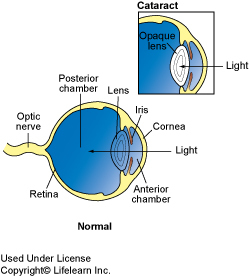 Inside the eye is a lens that focuses light on the back of the eye or the retina. Vision occurs at the retina. The structure of the eye is similar to a camera, which has a lens to focus light on the film. A cloudy or opaque lens is called a cataract. 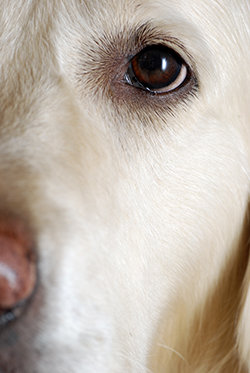 The most common cause of cataracts in the dog is inherited disease. Other causes include injuries to the eye or diseases such as diabetes mellitus ("sugar diabetes"). Some cataracts appear to occur spontaneously and are age related. Hereditary cataracts can affect many breeds of dogs. Some of the recognized breeds include the American Cocker, Labrador Retriever, French Poodle, Boston Terrier and the Welsh Springer Spaniel to mention a few. "Surgically remove cataracts and restore failing vision..."
Veterinary ophthalmologists can surgically remove cataracts and restore failing vision caused by cataracts in your pet. Most pets have few complications and return to normal activity, running and playing within just a few days of the surgery. Your veterinarian can arrange a referral appointment to an ophthalmologist to further evaluate your pet's condition and determine appropriate treatment options. Since the major cause of cataract is hereditary, cataract progression varies from breed to breed and individual to individual. Cataracts may develop relatively early in life in some breeds; in others the first signs are detected when the dog is older and progression is so slow that dogs still have reasonable sight well into old age. If the condition is hereditary, what can be done to prevent it from being passed on? This is a situation where prevention is better than cure. Many veterinary ophthalmologists offer Eye Certification Programs that offer breeders the opportunity to screen their breeding stock and make sure they are producing disease-free puppies.